Looking for the best Fishing trails around Bardstown? Find the top rated fishing trails in Bardstown, whether you're looking for an easy short fishing trail or a long fishing trail, you'll find what you're looking for. Click on a fishing trail below to find trail descriptions, trail maps, photos, and reviews. 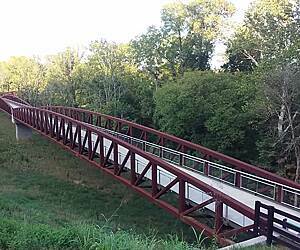 This is a scenic trail through 4 beautiful parks and a 5 mile connecting section (all off road) all along Floyd's Fork in easy reach of Louisville Metro. The trail is nicely paved the entire way with access to water fountains, restrooms, and bicycle repair stations strategically placed along the way. The trail provides a nice mix of terrain ranging from flat to rolling to hilly. This is a family friendly destination with canoe / kayak and bike rentals along with shuttle service in the park. There are even play and spraygrounds in a couple of the parks. it has potential, under heavy construction as i write this; some new construction, some resurfacing the existing. interesting that the old part has been around long enough to need resurfacing before these new parts have been laid. the equipment on this sunday was parked trailside. on the west side of town beyond milemarker 14-25 in either direction, the trail presently doesn't appear to be rideable or perhaps even existing. Entered this trail at Shelbyville road and completed a 30 mile round trip. The hills can be a real challenge if you are not accustomed to them. The surface is great and is a mix of asphalt and concrete. If you ride a recumbent where you sit back so far that you use a neck rest the expansion joints in the concrete can become annoying. The trail is very scenic with plenty of trail access points and several restrooms available along the way. 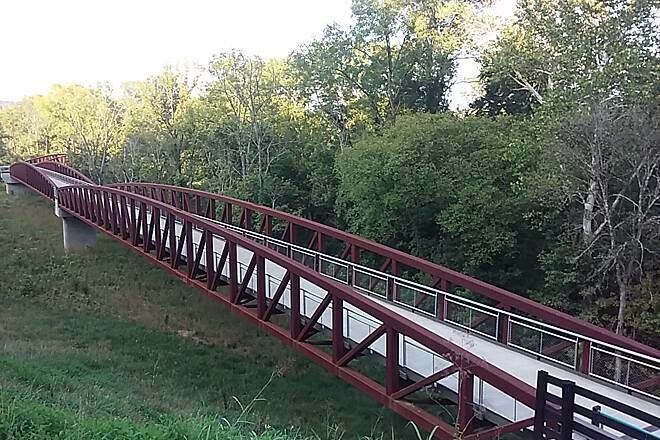 When the whole Louisville Loop Trail is completed and circles all of Louisville (100 miles of trails I believe) this will be a real jewel for Kentucky. I would rate this trail as easy and very beautiful. It is flat for the most part. Beautiful scenery along the mighty Ohio River. For those of you with little ones, please note it is a levee...ensure your children are capable of maintaining focus to keep their bicycle on an approximate 5' wide trail. There are a few steep points off of the edge of the trail.